My enquiries into this work led me to a local historian in Cleveland, who put me in touch with Sir Joseph’s grandson, Joseph Gurney Pease, to whom I am extremely grateful for providing most of the brief details recounted here. Fig 1 is a picture of part of the gardens of Hutton Hall, taken from the Sale Catalogue c1903. There is a small glasshouse on the left of the house, and the large glass structure to the right is the ‘exotic fernery’ that links the eastern wing to the main house. This looks quite similar to the one Pulhams built at Poles Park, near Ware in Hertfordshire, just a few years before – see ‘Site of the Month’ #33 – Feb 14, Fig 3. 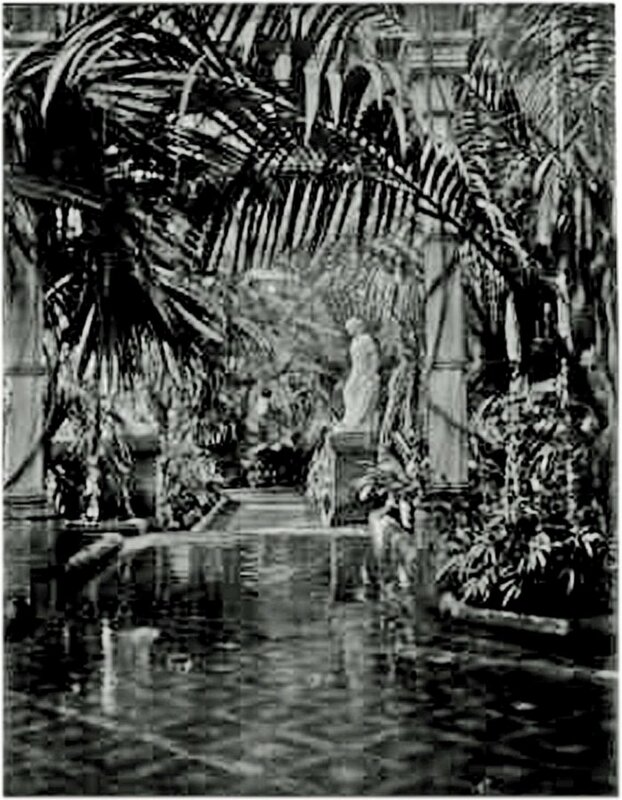 A section of the interior of the fernery is shown in Fig 2, and it certainly seems to have been a major feature of the house. ‘Hutton Hall, near Guisborough, is the Cleveland residence of Sir Joseph Whitwell Pease, Bart, M.P. The building is a modern magnificent pile, charmingly situated in the middle of the Hutton Lowcross Valley, and under the shadow of a fine range of hills. To the south-east is Guisborough Highcliffe, 1,000 ft above sea level, and three miles to the west stands Roseberry Topping, towering up to 1,054 ft.
‘The name Pease is, in the north of England, a household word. The family of which Sir Joseph is the head, is known to everyone as pioneers in the railway system; pioneers in the development of the great coal and iron industries of Cleveland and South Durham, and founders of the town of Middlesboro’. They are always ready to lend a hand in forwarding the interest of every good cause brought under their notice, and always ready to assist and help on the deserving poor. Such is the owner of Hutton Hall, and happy are those whose privilege it is to be in his employ. ‘Many readers of The Gardening World have heard of Hutton Gardens, which have become famous under the skilful management of Mr James McIndoe. . . I recently made a special visit, my object being to interview Mr McIndoe, and have a look round his extensive charge. ‘Leaving the pretty little station of Hutton, we walked straight off the platform into the gardens. A couple of minutes’ walk brought us to the conservatory at the west end of the Hall (on the left in Fig 1). This conservatory connects the morning room with the drawing room, and is filled principally with flowering plants of various kinds. A splendid lot of Thujopsis funebris in pots was noticed, their beautiful green foliage forming a delightful contrast with its associates. ‘From here we passed along the front of the Hall to the large conservatory, which covers an area of 90ft x 40ft, and is 20ft high. Many beautiful Palms, Tree Ferns, Araucarias, Bamboos etc were noticed. Very fine specimens of Areca Baueri, Dicksonia Antarctica, Chamacrops Fortunei, Corypha Australis, Araucaria Bidwillii, were noted, and the way in which all the plants etc luxuriate is a sure testimony that the conditions are agreeable. Mr Pease – referred to here as Gurney, in order to avoid confusion with the name of his grandfather, Joseph Whitwell Pease – told me that, tragically, his grandfather’s ownership of Hutton Hall was short-lived. In midsummer 1902 – just a few months after the publication of Mr Dollery’s article – there was a Bank crash in which Sir Joseph and his two sons were the sole partners. They suffered unlimited liability as a consequence, and were saved from bankruptcy only by the great generosity of other members of the family and friends, but one inevitable consequence was the forced sale of the Hutton Hall estate. 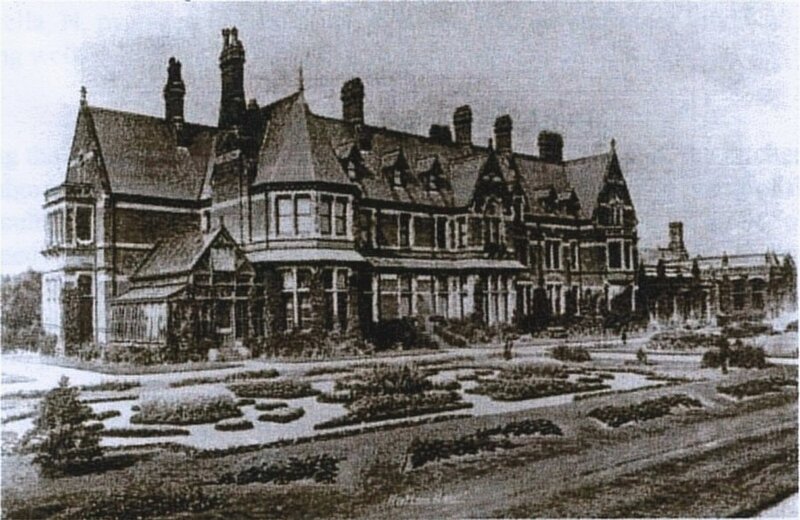 Hutton Hall was unoccupied, and the gardens were derelict at the time of this sale in 1935, and remained so until it housed a number of Spanish nuns and Basque refugees during the Spanish Civil War, after which it was used by the military during the Second World War. The Owners of Middlesborough Estate Ltd were taken over by a public quoted property company in 1985, and Mr Pease feels certain that they no longer have any interest in any part of the Hutton estate. The Hall itself, and most of the surrounding gardens, has now been converted into flats and Executive-type housing. Gurney himself never knew much about the estate, because his childhood was spent a few miles away, in Pinchinthorpe House, which Sir Joseph made over as a wedding present to his son, Sir Alfred – Gurney’s father. He consequently has no clear recollections of the ‘waterfalls in a mountain stream,’ referred to in James 2’s notes, but he did manage to find a couple of short extracts from his grandfather’s diaries that are relevant to this work. These entries are brief because of the small amount of space available in his Letts’ ‘3 Days to a Page’ diaries, and the fact that there are only two references is probably due to the fact that Sir Joseph spent most of his time at his London home. In May each year, he generally had a long fishing holiday in Falmouth before resuming parliamentary duties in London, and, during the summer recess, he generally spent at least a month grouse shooting and deer stalking at his shooting lodge in Scotland. According to Sir Joseph’s Abstract of Expenditure ledgers for the years 1868-70, the Pulham rockwork cost a total of £1,085: 1s: 0d, which, in those days, would have been considered a considerable amount of money. 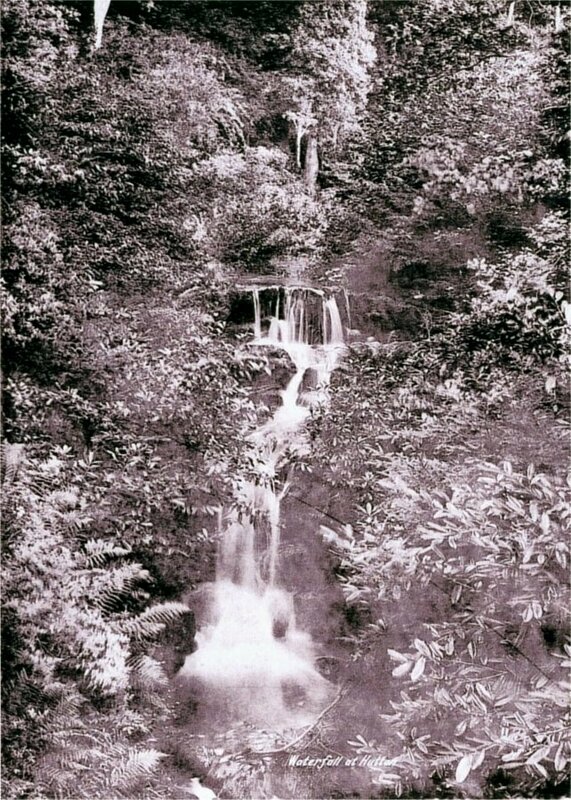 Gurney did not have a picture of the waterfalls, but Grace Dixon, the local historian from Cleveland, did manage to find one for me, and it is reproduced here as Fig 3. As Sir Joseph said in his diary, it ‘looked really well!’ . . .
Posted on May 31, 2015 June 4, 2016 by Claude HitchingPosted in Sites Month 2Tagged . . James Pulham and Son, Edward Pease, fernery, Hutton Hall - Guisborough, James McIndoe - Hutton Hall, Joseph Gurney Pease, Poles Park, Sir Joseph Whitwell Pease Bart – M.P, T W Dollery.